There's rarely a day that passes that I don't think of some type of article to write or content to add to the "future projects radar" to share here at some future date. However, sometimes it's fun for me to simply share a few thoughts and do what I did in the very beginning. To me, this site has always been about sharing thoughts and providing tips to improve your vacation experience, but it's also been all about bringing like minded people together to talk about things that others may find ridiculous or irrelevant in the majority of situations. Obviously this is a niche audience, but it's a niche audience that has exceeded my wildest expectations. Now, before I get overly sentimental and attempt to wax poetically (which is not my strong point lol), I'll stop myself and say that this may not be the article for everyone. It's not an array of clever trip planning tips or a story about the next big thing in Walt Disney World entertainment but rather a look back, while also a step forward in sharing a realization I came to a few short days ago. If you like this style of article, do me a huge favor and let me know in the comments on your favorite social media platform or even feel free to email me personally at guide4wdw@gmail.com. These are the articles I enjoy writing the most and I really do appreciate your feedback. 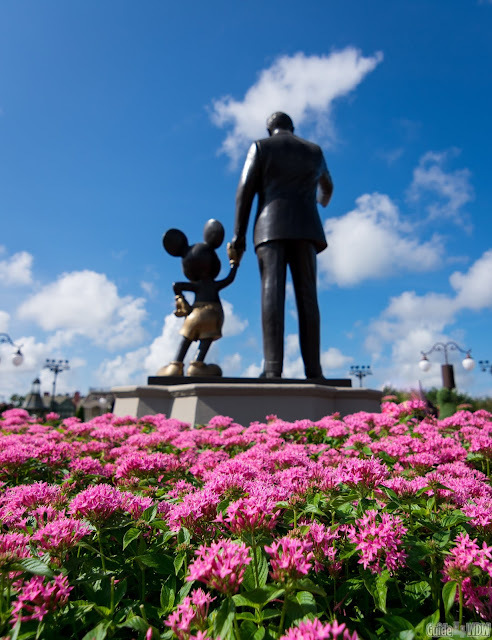 Setting all of this aforementioned thoughts aside, I want to dive into the History of Walt Disney the man, rather than the parks he helped create in sharing a few thoughts today. About a week ago I stumbled across a quote that so many of us have seen time and time again that reads, "It Was All Started By A Mouse." In my opinion, that simple statement shares with us one of the greatest lessons we can learn from Walt Disney that we can apply not only to the business world, but also to our daily lives. You see, 90 years ago Walt dreamed up a character that warmed the hearts of audiences and brought joy to kids and adults for generations. Mickey has inevitably become an international household name, but his roots are often entirely overlooked. In 1928, Walt devised a cartoon out of pure desperation on a train ride from Manhattan to Hollywood at a time that Walt called he and Roy's greatest low. Just a short time before this particularly train ride, Walt had faced the inherent theft of his work by the greedy Charles Mintz. While the story of Mintz is one for an entirely different day, the best way to portray the man would be as the ultimate antagonist in early Disney animation. At a time when Walt knew things couldn't get much worse, he sat down on the train and devised one the greatest characters the "film" world has ever known, Mickey Mouse. The most interesting part of all of this is that in relaying the information of the situation at hand to his brother Roy in a telegram, he simply stated that everything was OK. The telegram made no reference to the potential death of their company or a hatred for the nature of the business, or anything of the sort that you could readily imagine, but rather those simple words of reassurance. Years later, Walt shared the famous quote that headlines this article in stating, "I only hope that we never lose sight of one thing, that it was all started by a mouse." It was and is a statement that so many of us take for granted. We look back and think about how much of a literal statement that is and how in reality it is true in the most basic sense. At the same time though, we miss a portion of the message that I think Walt alway intended to share but would have never outright stated. We often tend to overlook Walt's early life in fond appreciation of what the man created later in life. We often overlook the fact that Walt Disney didn't have a glamorous life starting out. For years as a young boy he spent time working for his father without pay delivering newspapers at 3:30 in the morning in Kansas City, Missouri. From rain, to snow, to the heat of the summer, Walt knew the struggle of a hard days work and learned that lesson in some of the most unforgiving conditions imaginable at a very young age. When the paper route was completed the day was just beginning and Walt went off to school and returned that afternoon to deliver the evening news. After years of hard work, Walt was later quoted stating that he had never met someone that wasn't proud of the hard work of delivering papers. After facing trials and tribulations throughout his entire life, and after having his ideas and animators stolen by a man full of greed, Walt didn't mention the unfair nature of the issue but simply worked to reconcile the problem he faced while avoiding sharing his inevitable uncertainty of of the future with his brother. That story, in and of itself is one that exceeds my wildest expectations. However there's another piece to all of this. As we bring this whole article full circle, it's impossible for me not to respect Walt's quote, "it was all started by a mouse." It's a quote that shares a far greater meaning and the aforementioned newspaper story is a near perfect example of the thought that came to mind when I read that quote all over again a few short days ago. 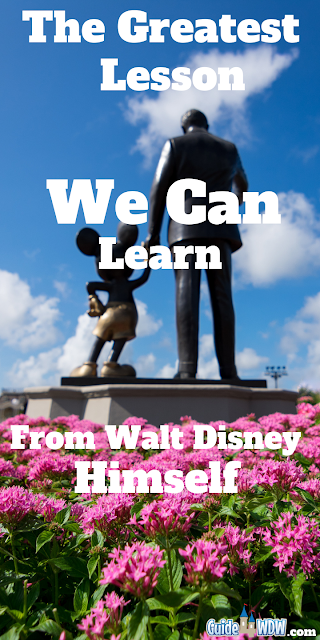 You see, Walt shared one of the greatest lessons we can ever learn in life in that one simple iteration of words. He shared the importance of being humble in everything you do. Walt knew better than anyone else that it wasn't "all started by a mouse." It was all started by him. Sure, the ideas likely snowballed from Mickey to Disneyland with an inordinate amount of steps in between, but at the very begging Mickey was Walt's idea and Walt's creation. No matter if his quote was intended to be a literal one or not, it still translates that incredible story of the importance of being humble. Walt certainly had a way with words, and no matter what his original intent for the phrase was, this is a lesson I see that could be vastly influential in many of our own lives. It's a lesson to encourage being humble in everything we do, a lesson in staying determined in every effort in life, and a lesson in striving to meet our goals no matter what obstacles may arise. One simple idea can change the course of your life and taking that one step today to make your dream come true tomorrow is something that I can never fully express the importance of. In my opinion, a good life isn't measured by how much money you make or how many things you acquire but rather the joy of waking up each day to do something you love. Life's too short to hate what you do, and taking the first step is inevitably the best way to turn your life into the daily life of your dreams. Need help planning your vacation? Let our friends over at Destinations to Travel (FREE - no obligation quote request form below) help you out at no additional cost to you! Their services are free and a great way for you to help out the site at no extra cost to you! Here's a closer look at why I recommend an Authorized Disney Travel Planner!